What am I allowed to do with the beats that I lease, what are the restrictions? 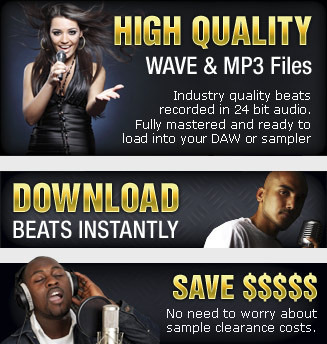 - Sell up to 2500 copies of your song in either disc or download format. - Perform live at unlimited shows, contests or battles. - Use the beat in your song video and stream it online an unlimited number of times. - Use the beat in your song video and have it aired on TV - credit must be given to www.beatlease.com. Production credit must be given to www.beatlease.com either in text format or verbally within the song. Text format credits must be included in all digital distribution meta data and printed material. You may not transfer, resell, re-license or assign the beat license to another party without our explicit permission. If you are lucky enough to land a synchronization license deal for TV or movie productions you must contact us to negotiate the synch fee. We are happy to work with our clients on synch deals and offer a fair service in the interests of you the licensee and our production team. In most cases a 50/50 split of the synch fee is appropriate. All sounds available from BeatLease.com are licensed, not sold, to you by BeatLease.com. BeatLease.com is either the owner or master licensor of the Sounds. The payment you make to download the sounds gives you the non-exclusive right to incorporate these sounds into your song. None of the above applies if you have purchased an exclusive license. With exclusive licenses there are NO restrictions and ownership of the beat is transferred to you. What does the Exclusive license allow me to do? When you purchase an exclusive license from Beat Lease you essentially take over full ownership of that beat. Copyright is transferred to you and all usage restrictions are lifted. This allows you to use the beat in any way you see fit. You will be given a signed 'transfer of ownership' agreement when your order has been checked and accepted. The beat will no longer be available for our customers to lease. Stems (multi-track audio masters) will also be provided in WAVE format. BeatLease.com cannot be held responsible for damage to any equipment, hardware or software arising from the use of any sounds or any type of data files downloaded from our web site. Playing sounds at excessive volumes may cause damage to hearing and equipment. Whilst we make all reasonable attempts to ensure all our files are virus free, BeatLease.com recommends that members and visitors alike run a virus scan on all files downloaded onto their computers. BeatLease.com recommends you have an up to date backup copy of your hard drive contents at all times. If you have any questions regarding our license terms please contact us directly.